Martín Ramírez is, together with Henry Darger and Bill Traylor, one of the three most significant self-taught American artists to come to public attention in the second half of the 20th century. Committed to a California mental hospital in 1931, Ramírez was “discovered” in the 1950s by Tarmo Pasto, a professor of psychology and art at Sacramento State College. Pasto was responsible for preserving Ramírez’s drawings and arranging his early exhibitions. Unfortunately, however, Pasto saw Ramírez’s work as a kind of primordial, preverbal form of expression and made little effort to talk to him about it. Owing to some combination of trauma, language difficulties, racism and lack of interest on the part of his caretakers, Ramírez was initially diagnosed as catatonic and later described as a mute. He could in fact speak, but he was long dead when the researchers Víctor and Kristin Espinoza first attempted to give him back his “voice” by reconstructing the artist’s biography and iconographic context. As a result, Ramírez’s remarkable oeuvre resists definitive interpretation; much of what we know remains speculative. Martín Ramírez was born in 1895 in what is now the municipality of Tepatitlán, a rural area about forty miles east of Guadalajara, Mexico. Not only was the region geographically remote, but its inhabitants, largely descended from Spanish colonists, were socially and ethnically distinct from the indigenous pre-Hispanic population. The Ramírez family were poor sharecroppers, and Martín received no formal schooling. However his father, one of the few literate members of the community, did teach him to read and write. In 1918, Martín married a seventeen-year-old orphan named Maria Santa Ana Navarro Velázquez, and the following year their first child, Juana, was born. Two more daughters, Teófila and Augustina, followed in 1921 and 1923. By 1923, Ramírez had saved enough to buy his own farm, a small house with about fifty acres of land. Here he raised crops and tended livestock that included sheep, pigs, two deer and a cow. Ramírez was particularly proud of his horsemanship and marksmanship, skills that enhanced his social standing and enabled him to travel and hunt. In addition to work and family, the third cornerstone of Ramírez’s life was the Catholic church, which he attended regularly. Despite outward appearances of prosperity, Ramírez had gone deeply into debt to buy his farm, and he despaired of ever being able to make ends meet. So, like many of his countrymen, he decided to emigrate north to see if he could earn more money in the United States. In 1925, he and three friends travelled by train first to Texas and, eventually, to northern California. He would never see his only son, Candelario, who was born in early 1926. For the next five years, Ramírez worked steadily in mines and on the railroad. He sent money home and kept in touch by mail and through his fellow émigrés. Gradually, however, his ties to Mexico loosened. Between 1926 and 1929, the region of Tepatitlán was wracked by civil war. The secular federal government brutally suppressed the local Catholic rebels, or Cristeros, confiscating their property and herding them into enclaves where they could be more readily controlled. The Ramírez family lost their farm, and Martín, erroneously believing his wife had gone to fight for the detested Federales, lost all desire to ever return home. By 1930, the United States was in the throes of the Great Depression, and the scarcity of jobs caused many Mexican immigrants to be deported or to leave voluntarily. Ramírez, however, lingered in California, evidently becoming increasingly destitute, depressed and confused. In January 1931 he was committed to the Stockton State Hospital, where he would remain for the next sixteen years. In 1948 he was diagnosed with tuberculosis and transferred to DeWitt State Hospital, a facility near Sacramento for the aged, senile and mentally handicapped. He died there in 1963 at the age of 68. Ramírez’s earliest known drawings were done in the margins of letters home, written in the 1920s. He drew regularly while in Stockton, but it was really only at DeWitt that he flourished as an artist. Not only did the latter hospital have amenities that included a crafts workshop, but it was here that Ramírez met Tarmo Pasto. Pasto, who was interested in studying the connection between creativity and madness, encouraged the hospital staff to preserve and date the artist’s drawings, and provided him with pencils and paper. Nonetheless, Ramírez often preferred to use scavenged paper, pasting together disparate scraps to create scrolls up to 100 inches in length. The distinctive patina of his work may be due to the fact that, because the artist was believed to have TB, his drawings were disinfected by heating. This practice was discontinued in the mid 1950s, either because the diagnosis was mistaken or because the artist was deemed cured. It is thus probable that Ramírez’s more brightly colored drawings were done later in his career. Ramírez left a legacy of over 300 surviving drawings. The oeuvre is dominated by several recurring subjects: tunnels and trains (together or separately); automobiles; animals; Madonnas; and (most common by far) the caballero or jinete: a (usually armed) rider on horseback. It is easy to interpret these subjects as evocations of the artist’s Mexican heritage: the animals on his farm and in the countryside, the devotional images in the rural church, his personal experiences as an hombre de caballo (man of the horse), or references to the Cristero rebels. It was at one time thought that the caballeros, routinely posed on stage-like platforms, were American cowboys derived from the Westerns shown at DeWitt’s in-house theater. And indeed, the riders may well represent iconic amalgamations of the artist’s native and adopted lands. 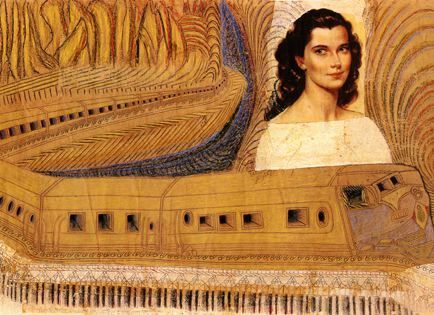 In a similar fashion, the trains evoke the artist’s journey to America, as well as a possible means of return; the tunnels binding past to present and present to an imagined future. In his art, Ramírez repaired and made whole his broken life.